We are a team of qualified Physiotherapists and Specialised Therapists , dedicated to treating all Muscular, Sports and Spinal conditions. Within our clinic we use 'ViMove' Technology along side individualised exercise programs. 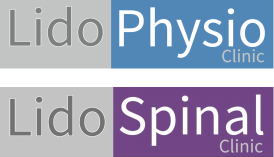 Here at Lido Physio and Spinal Clinic we are at the forefront of Physiotherapy, providing accurate and expertly delivered methods of treating your conditions. We work closely with local GPs and Consultants in order to deliver unique and personalised treatment programs. Paul has a passion and drive for treating the body as a whole system rather than isolated injuries. "Research shows that your back pain doesn't always originate in your spine. We all use complex movements when performing everyday tasks and if the supporting joints, muscles and structures have been "switched off " then the back structures can become overloaded, which results in back pain". Identifying, analysing and recording injuries or pain using high quality assessment techniques allows us to provide you with an accurate diagnosis of your problems. Once these have been established we are then able to work with you on creating a treatment plan that will return you to normal function. Lido Physio and Spinal Clinic was founded in 2012 by Paul Deveney, a well-known and experienced Chartered Physiotherapist in Jersey. Paul has taken a unique approach to spinal and muscular care, drawing on his many years of clinical knowledge. We use ViMove+ wireless sensor software to assess and treat musculoskeletal and spinal conditions. We are committed to using this technology with other methods of assessment to help people from all arenas, to improve their quality of life. Paul's mission is to combine advanced and scientifically proven technology, with the highest quality in Physiotherapy.